Get your first 3 issues for only £3! 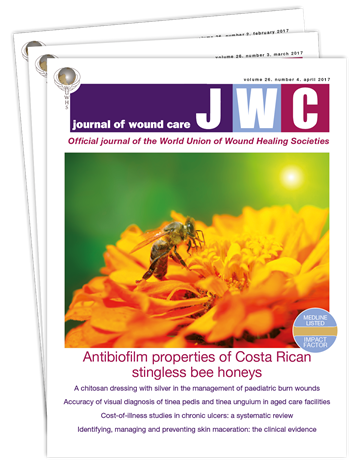 Peer-reviewed, and internationally focused, Journal of Wound Care (JWC) is the only monthly publication publishing up-to-date original research and clinical information on everything related to tissue viability. Medline-listed with an Impact Factor, it is an official partner of both the European Wound Management Association (EWMA) and the World Union of Wound Healing Societies (WUWHS) - testament to its quality and relevance to practice worldwide. JWC supports the professional development of specialist wound care practitioners by establishing a strong evidence base to inform advanced clinical knowledge and skills. Subscribe now and get your first 3 issues for only £3 - a saving of over 89% on our normal rate. Try Journal of Wound Care today and discover how we can help you in practice. We are sure you won't be disappointed - but you can cancel your subscription anytime. *£3 for the first three issues of your subscription. Price will revert to standard rate of £29.00 per quarter thereafter. Payment taken by Direct Debit every three months.